Two partners have to find their way to each other in order to transport substances to the remote ends of special nerve fibres to maintain their function. If this partnering process is disturbed, the cells may die in the worst case, resulting in neurodegenerative disorders such as amyotrophic lateral sclerosis (ALS) or spinal muscular atrophy. This is the central result of a new study published in the current issue of the journal Proceedings of the National Academy of Sciences (PNAS). It is headed by Professor Michael Sendtner and Michael Briese, both scientists at the Institute for Clinical Neurobiology at the University of Würzburg hospital. The researchers at the Institute for Clinical Neurobiology focus on so-called motor neuron disorders. Motor neurons are nerves that send impulses to the muscles to generate movement. Damage to these neurons results in muscle atrophy, palsy and ultimately functional loss of muscles. The respiratory muscles are usually affected, too. There is currently no cure for these diseases. "We know from previous studies that signal transmission defects from motor neurons to the muscle play a key role in disorders such as amyotrophic lateral sclerosis and spinal muscular atrophy," Michael Briese explains; he is the lead author of the published paper. These defects are triggered by disrupted transport processes of special molecules: the so-called messenger RNAs (or mRNAs for short) into the axons, the long endings of motor neurons. What makes the absence of mRNAs so disastrous is that they carry information the neuron needs to synthesize new proteins. "When the mRNAs are missing, the proteins can no longer be synthesized in this cell compartment which is crucial for the function of the nerve cells," Michael Briese explains. As a result, the cell lacks proteins which are indispensable for maintaining axonal function. It is currently unknown how the particles necessary to transport these mRNAs are composed. In its recently published paper, the working group of Michael Briese, Lena Saal-Bauernschubert and Michael Sendtner demonstrated that a noncoding RNA is also significantly involved in these transport complexes. Its name: 7SK. For this purpose, the scientists developed new cell culture systems that enabled them to study the function of such mRNA particles for the transport of mRNAs into the axon. This allowed them to demonstrate that 7SK together with hnRNP R, an RNA binding protein, is involved in transport complexes for functionally relevant mRNAs. If one of the two partners is missing, these transport complexes are disrupted which triggers the effects described above: reduced transport of the associated mRNAs resulting in decreased axon growth. The scientists believe that their findings will open up new approaches in pharmaceutical research. "This may enable further improvements of new therapies which are already being used successfully in the hospital to treat spinal muscular atrophy by creating options that may influence the composition and regulation of such RNA transport complexes in axons and motor neurons," Michael Briese says. 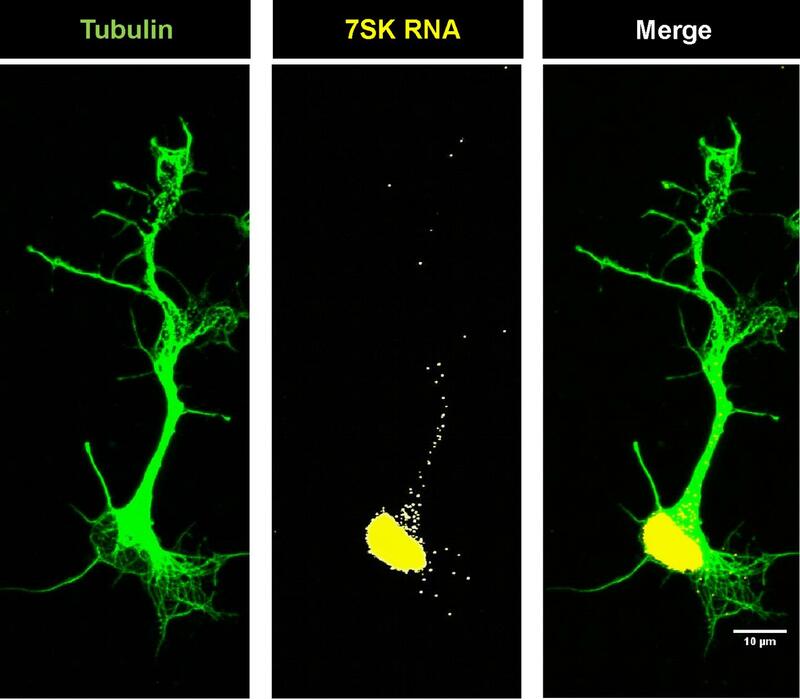 At the same time, the researchers hope that the new findings will turn the spotlight more on the role of the mRNA transport for motor neuron function and its dysfunction in neurodegenerative diseases. In a next step, Briese and Sendtner are aiming to investigate to what extent the newly identified transport particles are impaired in motor neuron disorders and thereby contribute to motor neuron degeneration.